We offer comfortable beach front accommodation just across the road from stunning Thornton Beach with the world's oldest rainforest (135 million years old!!) as a backdrop. 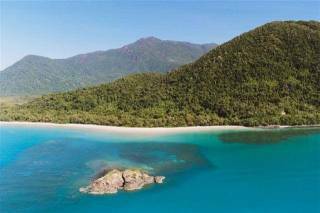 Thornton Beach is the Daintree's best kept secret, located halfway between Cape Tribulation and the Daintree River. 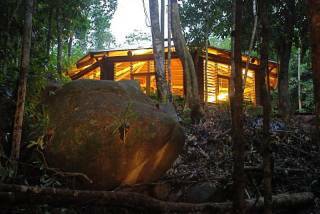 This is the jewel in the crown of the Daintree Coast. If you are looking for isolated beaches, breathtaking views and great photo opportunities, look no further. 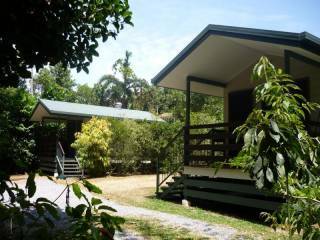 Surrounded by the Daintree National Park and looking out on the Great Barrier Reef Marine Park our Beach Bungalows are the ideal accommodation for a relaxing holiday for two. They are solar powered and offer queen size bed, ensuite bathroom with toilet and shower, tea/coffee making facilities, small refrigerator and private verandah with views of the Coral Sea. We are situated 2 hours drive north of Cairns along the scenic Captain Cook Highway; 1 hours drive north of Port Douglas; 20kms north of the Daintree River and 15 kms south of the visitor hub of Cape Tribulation. This is also the perfect place to relax and unwind with miles of pristine beaches to explore, swimming in local creeks, or just lazing under a tree. A short walk down the beach to the mouth of Cooper's Creek will reveal the stunning views of Thornton's Peak - Queensland's third highest mountain. Please leave the place how you found it. No smoking inside. Bookings are confirmed on receipt of payment or credit card details. We have a 7 day no cancellation policy. Cancellations outside 7 days - full refund less 5% administration fee. Cancellations within 7 days - no refund, unless property can be resold. 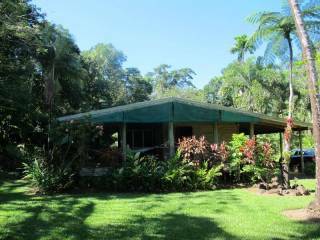 From Cairns or Port Douglas head north on the scenic Captain Cook Highway, drive through the township of Mossman and 25kms north is a turn off to the right signposted Daintree River and Cape Tribulation. Turn right here and this will take you to the Daintree Ferry to cross the Daintree River (ferry operates 6am to midnight 7 days a week and costs $24.00 return per car). When you drive off, travel a further 20kms/20 minutes and you'll come to Thornton Beach. Our property is the last one on the left, opposite Thornton Beach Kiosk. You'll see our Thornton Beach Bungalow sign out the front.